A massive entry of cattle on Friday included around 400 head of young stock ie dropped and weanling calves. These sold in a terrific trade for quality lots. A Clanmaghery farmer sold 44 head Limousin and Hereford male and female with a top of 288p/k for a 250k lot at £720, 340k at £885 or 260.3/k, 290k at £745 or 257p/k. This pen averaged well over 220p/k. A Grallagh farmer sold five Charolais to average 244p/k. 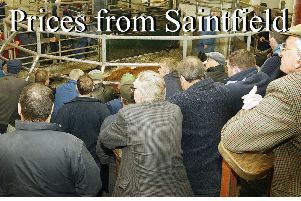 A Banbridge farmer sold 7 to average 245p/k. Dropped calves up to three months old sold to £520 for a Belgian Blue from Seaforde. Aberdeen Angus heifers from the same farm sold at £400 and £380. Good heifers were a flying trade to £1,200, £1,130 and £1,075 for a Ballinran farmer. A big entry of quality bullocks cleared up to £1,320 for a 654k Limousin from Begney. A 510k Charolais bullock from Kilcoo sold at £1,035 and a 512k lot also at £1,035. Seaforde farmer: £520, £400, £380, £330. Newry farmer: Simmental bulls, £305 and £250. Quilly farmer: Hereford bulls, £300. Rathfriland farmer: £355. Ballyward farmer: £290. Donaghcloney farmer: Belgian Blue bull £290. Mayobridge farmer: £265, £265, £260 and £260. A second Mayobridge farmer: £200 twice. Drumlough farmer: Simmental female £200. A pen of strong Friesians from Ballynahinch sold at £370 each. Clanmaghery farmer: 44 Charolais and Hereford, 414k at £990, 394k at £930, 340k at £885, 400k at £885, 354k at £880, 384k at £860, 340k at £885, 250k at £720, 300k at £750, 348k at £790, 290k at £745, 290k at £730, 356k at £805. Ballyward farmer: 342k at £800, 300k at £765, 306k at £725, 318k at £745. Castlewellan farmer: 320k at £770, 328k at £740. Clough farmer: 364k at £730, 342k at £700, 224k at £520. Rathfriland farmer: 386k at £835, 362k at £800. Grallagh farmer: 232k at £590, 234k at £585, 226k at £580, 234k at £580. Ballinran farmer: 646k at £1,200, 598k at £1,130, 518k at £1,075, 530k at £1,005, 528k at £990, 506k at £950. Kilcoo farmer: 550k at £1005, 488k at £895, 450k at £790. Ballymartin farmer: 388k at £785, 390k at £740, 416k at £780. Attical farmer: 408k at £740, 352k at £720. Begney farmer: 654k at £1,320, 702k at £1,300. Banbridge farmer: 568k at £1,160, 584k at £1125, 538k at £1,080, 556k at £1,075, 578k at £1,060, 524k at £1,055. Dromore farmer: 386k at £780, 362k at £690, 360k at £650 and 352k at £680. Ringbane farmer: 558k at £1,070, 594k at £1,100. Kilcoo farmer: 512k at £1,035, 512k at £1,030, 526k at £1,020, 500k at £1,038. Castlewellan farmer: 284k at £720. Aughnaskeagh farmer: 438k at £760, 350k at £650. Drumlee farmer: 438k at £925, 448k at £915, 438k at £925, 472k at £900. Fat lambs sold to a top of £87 per head for a Ballyward farmer. The fat lamb section showed an increase in price of approximately £3.00 per head. Store lambs sold to 437p/k for 12.8k at £56 from Downpatrick. Downpatrick farmer: 12.8k at £56 or 437p/k, Benraw farmer: 16.9k at £70 or414p/k. Garvaghy farmer: 17.5k at £71. Ballyward farmer: 16.6k at £65. Dromore farmer: 15.4k at £62. Loughinisland farmer: 17.4k at £70. Finnard farmer: 18k at £72.50. Castlewellan farmer: 17.8k at £70. Ballynahinch farmer: 19.4k at £74. Markethill farmer: 19.5k at £73. Ballyward farmer: 33k at £87. Ballywillwill farmer: 29k at £86. Ballyward farmer: 31k at £86. Knockgorm farmer: 27.2k at £85. Kilcoo farmer: 26k at £85 and 26k at £84. Ballyward farmer: £86. Rathfriland farmer: £80. Gransha farmer: £83. Castlewellan farmer: £83.